Collingwood is in the heart of magnificent unspoiled walking country, with wild west coast beaches, and abundant bird life. Golden Bay activities are a plenty in the Bay. It also boasts an interesting mining and farming history. It is further enriched by a varied artistic community and unique and intriguing eateries. There are plenty of great walks and sites to enjoy. Farewell Spit Eco tours A big attraction in Golden Bay. 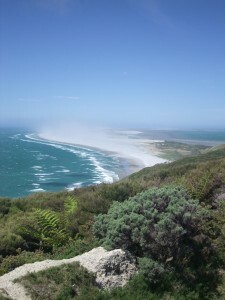 Guided bus tours of Farewell Spit – a bird sanctuary and wetland of international importance. .
Wharariki Beach Walk Explore the rugged west coast beach, find seals, caves, sand dunes and rough seas. Salisbury Falls A secret little swimming hole right under the falls. A must for the family, very safe and very fun. For anyone who loves to skim stones across clam water this is a skimmers paradise with thousands of perfect skimming stones. Golden Bay Kayak rentals. Sea kayaking in Abel Tasman National Park. Kaituna Forks Track A 2 hour return trip through wonderful native bush. Milnthorpe Park A recreational walking track with with marked trials through plantings of native and exotic species to the beach. Rameka Track A Mountain Biking track which starts in a strange, limestone wonderland, and winds through native forest from the top of Takaka Hill down to Golden Bay. Waikorupupu Hydro walk One of the Bay’s best half-day walks. It retraces an old gold mining water race. Kaihoka lakes The coastal hills form a dramatic backdrop to these 2 beautiful lakes. A casual 20 minute return walk through enchanting coastal broadleaf forest will take you between these the 2 lakes. There is space to picnic at the car park and further along the road next to the lake. An awesome place for a swim during the hot summer months. The Grove Scenic Reserve. A 10 minute walking track which winds through the narrow canyons in the limestone ending up at a dramatic lookout. Cobb Valley One of the most interesting regions for naturalists and hikers with its remarkable bush and mountain scenery, impressive botany and geology. Nowhere else in New Zealand has such a complex series of ancient rocks been eroded into such different landscapes. Westhaven Inlet It doesn’t matter if the tide is in or out, the estuary has a natural beauty. Combined with coastal forest and tidal channels, Westhaven Inlet is full of unique and breathtaking scenery. Those interested in a relaxing day can take a drive along the estuary, find a picnic spot and potter around the edge of the sand flats. Its also a great spot for kayaking and birdwatchers will love it here too. NZ Trout Adventures. Spectacular scenery, crystal clear waters and a good population of Brown Trout awaits. Anatoki Salmon Fishing. A great fun day for all to have, catch your own tasty salmon and have it prepared ready to eat on the spot. Cape Farewell Horse Treks. Ride stunning beaches, winding trails across hills and view magnificent West Coast scenery. Aorere Centre Collingwood. Discover western Golden Bays rich history. Rockville Machinery and Settlers Museum. Steaming traction and stationary engine displays, trucks, tractor and balers and plenty of other historical farm machinery. Langford Store. A living museum only 15 minutes inland from Collingwood towards the Heaphy Track serving coffee, tea, sweet treats, with treasures on the shelves for all. Open since 1928. Wainui Falls. A beautiful 40-minute bush walk with a swing bridge. The track follows the river and you enter some real NZ bush. Scenic Flights. Come fly with Mit. Scenic flights around Golden Bay starting at just $40. Puponga Farm Park. Various walking tracks of Puponga Farm Park you can explore Wharariki Beach, Cape Farewell and Fossil Point. Waikoropupu Springs. A short 30 min loop walk to NZ’s largest freshwater springs and home to the clearest spring water in the world. Golden Bay Arts. The natural beauty of this area has attracted more artists and craftspeople living in one area then anywhere else in New Zealand.